Another three points, which gives a five point gap between us in second, and Liverpool in third and guarantees us at least a top four finish. Manchester United were the dominant side in the first half, and Arsenal played well in the second half. Manchester United started the game well, and took the lead in the sixteenth minute, with a volley from Paul Pogba. Henrikh Mkhitaryan equalised in the fifty-first minute, after Ander Herrera misjudged Antonio Valencia 's pass. Allowing Henrikh Mikhitaryan to pounce, run forward, and score. Arsenal had good patches, but rarely troubled De Gea. Marouanne Fellaini came on in the sixty-fourth minute for Ander Herrera. He scored with a header, after connecting with a nice cross into the box by Anthony Martial. Winning the game three minutes from the end. Had a relatively quiet game. Made some routine saves before, and after Mkhitaryan's equaliser. Very solid defensively as usual. But didn't offer much going forward. Hesitated when the ball broke free, and allowed Mkhitaryan alot of free space to score. Also failed to connect with the ball from twelve yards, in a separate occassion. Had an ok game otherwise. Not up to his recent high standard though. He showed that he is gaining more and more confidence on the ball. Just like with Smalling, he got caught out for Mkhitaryan's goal. He was a constant threat down the left, causing the Arsenal defence a lot of problems. A solid display as usual. 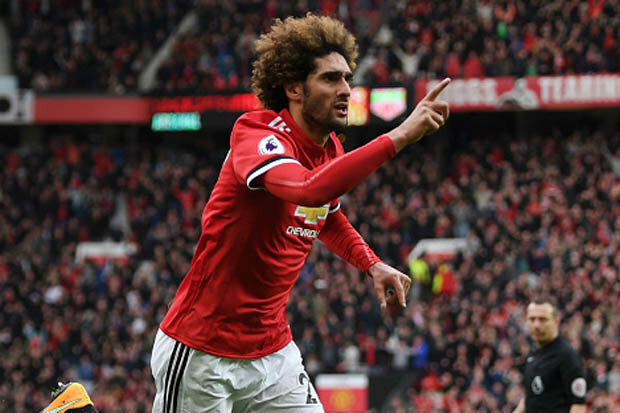 Provided the assist for Fellaini's winning goal. Along with Smalling and Lindelof, he also hesitated when the ball broke free. Leading to Mkhitaryan's equaliser. Apart from that, he was very solid in the midfield. Making key tackles and interceptions. Opened the scoring in the sixteenth minute, with a volley on the rebound. This was after Sanchez's header hit the post, and then landed at Pogba's feet. Was a commanding presence in the midfield. But did give the ball away at times, but otherwise a good performance. Very enthusiastic as usual. He combined well with Matic. Some nice one -two passes on occasion. Played further forward after Mkhiraryan's equaliser, but didn't produce anything of note by doing so. Misjudged Valencia's inside pass, which allowed Mkhitaryan to get the ball and score. Lost possession regularly. On many occasions, he was guilty of making the wrong pass at the wrong time. Not his best performance in a Manchester United shirt. An average display. He was constantly booed by the Arsenal fans in the away section. Nearly opened the scoring himself, seconds before Pogba did. He hit the post after a diving header, after a nice cross into the box by Lukaku. He was impressive in the first half, showing how much he has improved. But in the second half, he wasn't as productive. Overall, he impressed me with his enthusiasm. He was the Man Of The Match for me. He bullied the Arsenal defence during many spells in the game. Provided a cross that was on the money, which led to Sanchez's headed attempt that hit the post. And then to Pogba's volleyed goal for the opener. Suffered an injury, forcing him off. Replaced by Marcus Rashford in the fiftieth minute. Showed his blistering pace and enthusiasm throughout. But failed to make any serious impact. Put the ball in the back of the net, but was flagged offside. Came on in the sixty-fourth minute, with Herrera making way. Showed great tenacity in the midfield, making tackles in key areas. Scored the winning goal, after heading in Martial's cross in the box in the ninety-first minute. Brought on in the sixty-fourth minute. With Lingard being taken off. Made his usual skilful runs, running at defenders and causing them problems. Making the game look easy at times. Provided the cross in the box, leading to Fellaini's winner.